This entry was posted on 4th April 2019 by Marci Cornett. You and your baby deserve baby care products that are easy to use, free of harmful chemicals, and sustainably produced. You shouldn’t have to choose between products that are convenient and products that are healthy for your baby and eco-friendly. These natural baby care products make sure you don’t have to. Most of us, babies included, just don’t get enough exposure to healthy amounts of sunlight, and that causes us to be deficient in vitamin D3. Without sufficient vitamin D3, a baby won’t have the means to adequately absorb calcium and phosphorus: both important for building strong bones and teeth. Vitamin D3 also supports cell growth as well as neuromuscular and immune function. Health Departments recommend a daily dose of 400IU of vitamin D3 for babies who are breastfeeding. Keep in mind that infant formulas are already fortified with vitamin D, so there’s no need to give your baby an additional supplement if she’s drinking more than 500ml—or about a pint—of infant formula each day. The BetterYou DLux Infant Vitamin D3 Oral Spray is an easy way to meet the recommended 400IU daily requirement for your baby. Why give a baby probiotics? A study published in JAMA Pediatrics found that infants who take probiotics in their first three months of life are less likely to suffer from colic, constipation and acid reflux. There’s also information to suggest that probiotics can help develop a baby’s immune system and balance gut bacteria—particularly important after a round of antibiotics. Bio-Kult Infantis Probiotic Formula is an advanced multi-strain supplement with seven different strains of probiotic cultures selected especially for infants. The supplement also contains Omega-3 and Vitamin D3, two very important nutrients for baby’s health. 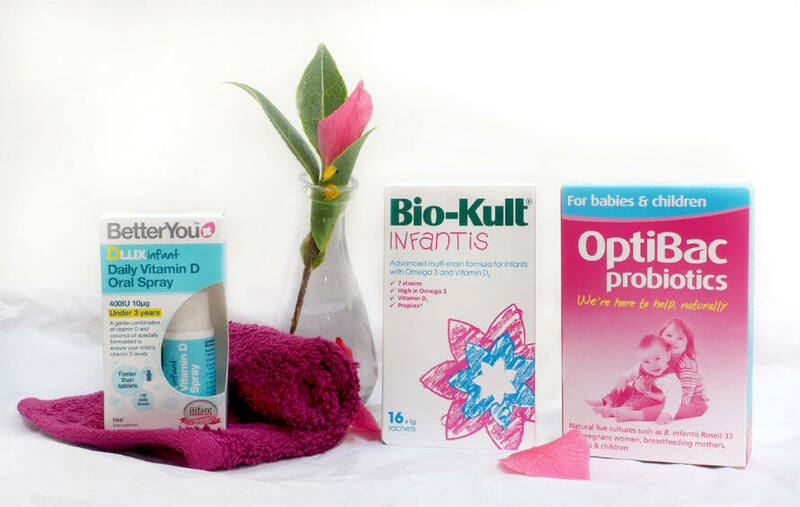 Another option for your baby is Optibac Probiotics for Babies and Children aged 6 months to 12 years. This supplement is both a probiotic and a prebiotic (a type of fiber that serves as a food source for healthy gut bacteria). It contains the dominant probiotic cultures in healthy infants and children: L. acidophilus, with Bifidobacterium infantis & bifidum. These cultures support digestive health (for those pesky tummy troubles) and a strong immune system. Bambo Nature Nappies have met the rigorous requirements of the Nordic Swan Eco-Label and earned its seal of approval. The label guarantees an environmentally-friendly product and shows that the nappies don’t contain ingredients such as perfumes, lotions, flame retardants, PVC, or other potentially toxic components. Turns out you can even incinerate these nappies because they won’t release harmful fumes into the atmosphere. ‘But do they work?’ we hear you ask. Well, we have loads of customers who think so and continue to buy these nappies for their babies. They’re made to be soft, flexible, breathable, and absorbent. A good choice for the environment and for your baby. The wipes from Earth Friendly Baby are so soft and thick and just right for delicate baby skin. The wipes are 100% biodegradable, cruelty-free and hypoallergenic. They’re infused with organic chamomile and calendula to leave baby’s skin feeling silky soft and squeaky clean. Unlike conventional baby wipes, which contain plastic and end up in landfills, the Kinder by Nature Natural Baby Wipes are made from wood pulp so they’re biodegradable and compostable. The cloths are infused with organic ingredients including Aloe Vera (to soothe baby’s skin), purified water, and gentle vegetable preservatives. What you won’t find in them is alcohol, parabens, or petrochemicals as well as many other potentially harmful ingredients. The natural wipes are unscented and the herbal wipes contain organic ylang ylang which supports skin health and a good mood. While it’s easy to find BPA-free plastic baby bottles these days, a glass bottle will always be our first choice. Why? There’s evidence to suggest that BPA alternatives may have the same endocrine disrupting effect as regular old BPA. It’s a case where the cure may be just as bad as the disease. So we’ll go with glass, thank you very much. Weleda is a naturopathic company that has been around since the early 1920s. They make their cruelty-free skincare with biodynamic ingredients and Green Energy methods. The Weleda baby care ranges are just right for nourishing and protecting delicate baby skin. Whether you want to prevent nappy rash or soothe a painful outbreak, the Weleda nappy change creams are up to the task. The Baby Derma White Mallow cream is made for babies with hypersensitive skin. White mallow, pansy, sesame oil and coconut oil help to retain a healthy skin balance while zinc oxide keeps skin dry. The Calendula Nappy Change Cream is made with natural, nourishing ingredients including biodynamic calendula and organic chamomile. This cream softens baby’s skin and treats any soreness or irritation. This effective product continues to be an Organico bestseller. 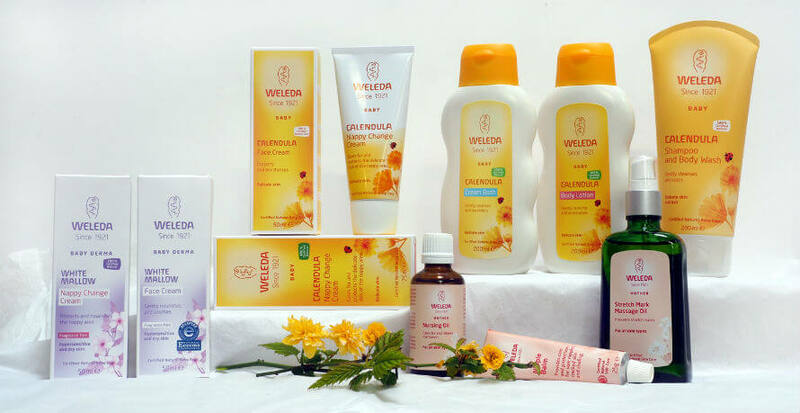 The entire Weleda Baby range includes more products from the White Mallow and Calendula lines: body washes, bath cream, shampoo, and face creams. The ingredients are specially chosen to be extra gentle on baby’s skin while treating it to deep nourishment. And for now, you can get the Calendula range on special offer. But it’s not just babies who deserve TLC! Weleda makes very special products to support the health and happiness of new mums during and after pregnancy. The Stretch Mark Massage Oil helps smooth the skin with essential fatty acids from sweet almond oil, and relieve tightness from sore muscles with arnica extract. Vitamins in wheat germ oil help nourish and refine the skin’s texture. Regular use of Weleda Nursing Oil during late pregnancy will help prepare your body for relaxed, fulfilling feeding sessions once your baby arrives. By massaging the oil into the breasts, the warming essential oils relax the breasts, stimulate milk flow and relieve tension. Weleda turned to midwives and pharmacists for guidance when creating their Nursing Tea for breastfeeding mothers. The blend of organic herbs is mild and refreshing in flavour and formulated to balance fluid intake and support natural milk production. Shop the nursing tea and enjoy a special offer. When taking care of a baby, there are a thousand things on your plate demanding your attention; don't let uncertainty about which products are good for your baby be among them. With all of these natural, health-supportive and eco-conscious options available, you can feel good about the baby care products you choose. Each one is gentle on the earth and (very importantly) gentle in the way they promote the wellbeing and happiness of your baby.